Above is an image of a recent project. It’s an old telegraph sounder seated in a wooden resonator. Underneath it, I’ve added a small board with electronics so that the telegraph can tap out messages from Twitter. Electrical telegraphs were invented in the 1800s to communicate quickly across long distances. Devices were physically connected by wires between stations, and operators tapped out messages in Morse code on a small, paddle-like device called a key. The sounders tapped out those messages, so one could hear the code spaced between the taps of the sounder. The small black cans in the image are covering coils of wires. When a current goes through the coils, they act as electromagnets, and pull down the black tab above them. That movement brings down the armature, a clacking noise is heard. When the current stops, the black tab is released, the arm raises, and another contact is hit to make another noise. Locally, a historic roundhouse is being renovated. As part of that process, those behind the renovations have also been exploring the expansive history of railways, roundhouses and the related technologies and effects of those spaces in general. The telegraph played a role, as railway lines afforded the establishment of distant telegraph cables, connecting networks of stations and, eventually, facilitated improved train routing. This project was an attempt to connect technology rooted in the 19th- and early 20th-centuries with 21st-century networks. How could we make that telegraph sounder tap out Twitter messages? The results bridge those time periods through the technologies used. The telegraph sounder was used as the starting point and is the output of the device. 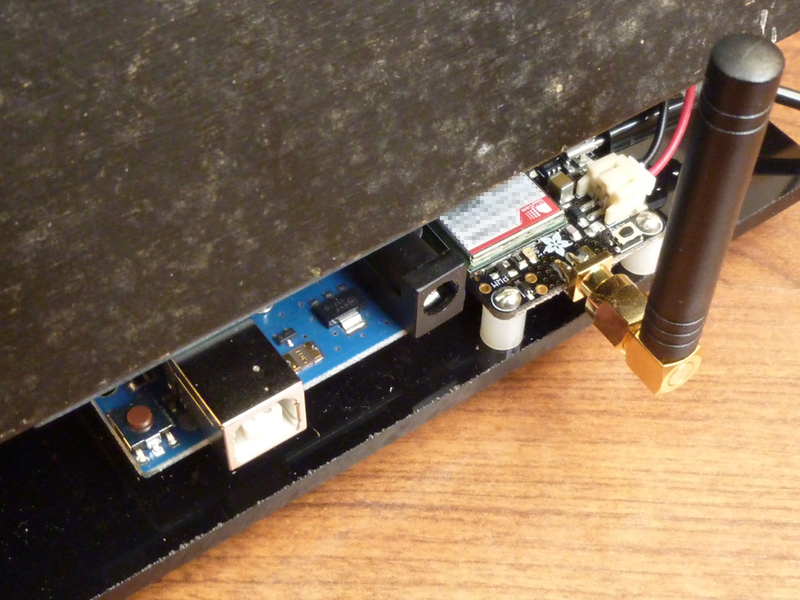 To operate the sounder, an Arduino microcontroller board was connected to it. 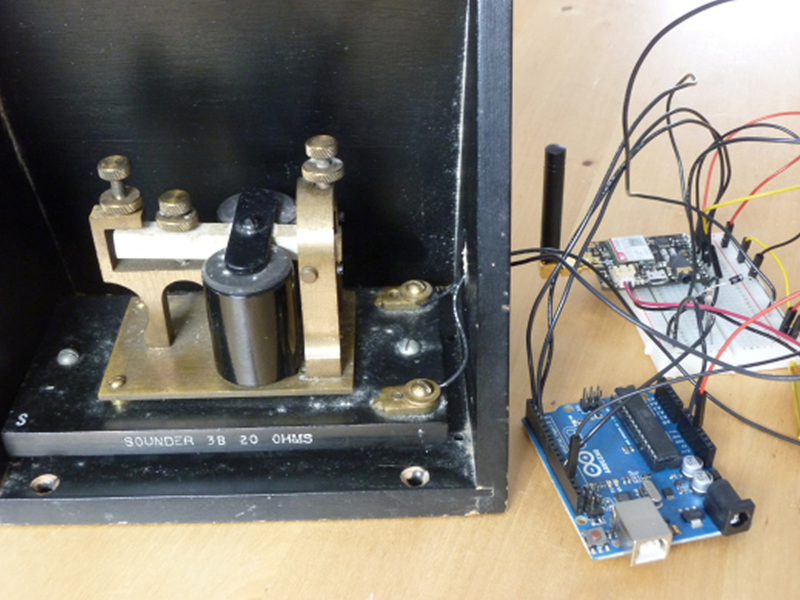 The Arduino can control the sounder by activating the coils—turning them on and off via one of the Arduino’s digital I/O ports. Mark Fickett’s Arduinomorse library was used to translate messages into Morse code and activate the sounder, and a few components (a resistor, diode, and transistor) were added to protect the digital pin of the Arduino by separating the activation signals from the powering of the coils. The final results are a standalone telegraph sounder that is connected to cellular phone networks. It receives SMS messages and can tap those messages out in Morse code. It can operate off batteries if necessary, so it should work anywhere it can connect to a cell phone signal. The SMS messages for this come from Twitter. The device’s cell phone number is associated with a Twitter account, and that account is set up to send an SMS to that number whenever the account is mentioned. If you’d like to activate the telegraph with a Twitter message, mention @ldntelegraphco and your tweet will be tapped out for those near it to hear. Post by Devon Elliott, attached to the Makerspace project, with the physcomp tag. All images in this post care of Devon Elliott. Original post by Devon Elliott at devonelliott.net.